Pool Clash: 8 Ball Billiards Snooker Game: Get ready to play challenging online 8 ball pool matches! Precise the cue steering, use buttons to set the angle and hit the ball precisely! Complete 5 different difficulty levels in the 8 ball Single Player Mode. Discover over 320 unique challenges! Select from 23 unique cues and use them wisely! Perform amazing tricks with accurate steering options! 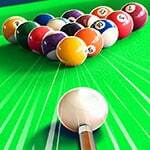 Pool Clash: 8 Ball Billiards Snooker Game is one of our Sports Games at Round Games. It is also tagged as a pool game. To play even more free games, view our most played and all games pages. If you want to play more games like this game: Then you can simply check out the games inside the game tags that are the most relevant to your interests or check the Sports Games category or check the related games section at the end of the game page. Also make sure to check out 8 Ball Billiards Classic Game, you may enjoy playing it. Click or tap and drag to set power and angle of the cue stick.